Are we changing the angle of attack by changing the pitch of an aircraft? if I pitch the airplane up, but also increase power and am able to maintain the same speed, then no, the AoA hasn’t changed, although it may have varied in the transition between one situation and the other. And yes, I’ll probably be climbing, although there are exceptions, becuase… if I pitch up, slow down, and maintain the same altitude, then undoubtedly the AoA has increased. Flying slower reduces the amount of lift generated. An increased AoA gets that back so I can maintain the altitude. Can someone explain these situations why exactly are they producing different results in AoA? Just as NASA also messes up the proportions in this diagram for gliding flight-- https://www.grc.nasa.gov/www/k-12/airplane/glidvec.html -- again, lift is shown as being greater than weight, when it should be less than weight, so we can build a closed vector triangle from weight, lift, and drag. For more, see this answer to a related question What produces Thrust along the line of flight in a glider? Now as to your questions-- to a first approximation we can think of our pitch control inputs-- the position we are placing the control stick or yoke in, in the fore-and-aft direction-- as most directly governing angle-of-attack, not pitch attitude in space. Pitch attitude in space is influenced by the climb angle which is influenced by power setting. Now, there are all kinds of inter-relationships that complicate things-- for example on a high-wing plane with flaps down, adding power may produce a strong downwash over the tail that tends to lead to an increase in angle-of-attack. But to a first approximation we can think of our pitch control inputs as governing angle-of-attack. There is a slight delay between a change in pitch control input and a change in angle-of-attack, due to the aircraft's rotational inertia in the pitch axis. If I tell you that I've increased my aircraft's pitch attitude by 10 degrees but I don't tell you what I did with the elevator control to make that happen, nor do I tell you whether I've added power or not, then you have no way to guess whether I've kept the angle-of-attack constant and started climbing due to added power, or I've managed power as needed to keep altitude constant while transitioning to a higher angle-of-attack and lower airspeed, or any number of other possibilities-- I might even have put the stick or yoke forward to decrease the angle-of-attack and still added enough power that the aircraft transitioned into a climbing flight path resulting an in increase in pitch attitude. For example when a jet fighter aircraft is climbing vertically on raw thrust alone, the control stick is probably forward of the position where it would be during horizontal flight at the same airspeed. Certainly the angle-of-attack is lower in the vertical climb, than in horizontal flight at the same airspeed! From the standpoint of what is really going on physically with the aircraft, most flight training curricula vastly over-emphasize the idea that the pilot is directly controlling the aircraft's pitch attitude. What he's really doing is controlling angle-of-attack and power setting. Yet the former way of looking at things works well enough in actual practice (e.g. flying an ILS glide slope by referring to an attitude indicator rather than an angle-of-attack meter as the primary guide to pitch control) and is simpler to think about. A key point is that our flight operations are usually conducted on the "front side of the power curve", where for a given power setting, an increase in angle-of-attack usually results in an increased climb rate and an increased climb angle. Therefore moving yoke or stick aft results in an increased angle-of-attack AND an increased climb angle (or a decreased glide angle) AND an increased pitch attitude. On the "back side of the power curve", like just above stall speed, an increase in angle-of-attack will generally lead to a decreased climb angle or increased sink angle, and the aircraft will end up in a more nose-down pitch attitude, so the idea that we're somehow directly controlling pitch attitude with the control yoke or stick no longer works very well. Your question indicates a desire to better understand some of the physical relationships at play. Lift is proportional to (lift coefficient * airspeed squared). Lift coefficient is determined by angle-of-attack, with higher angles-of-attack creating higher lift coefficients. As shown in the vector diagrams attached to the two links given at the start of this answer, for shallow to moderate climb or dive angles, lift is NEARLY equal to weight. Actually, lift is a little less than weight unless the flight path is exactly horizontal, but for shallow to moderate climb or dive angles, the difference is small. Since weight is staying constant, we can conclude that for shallow to moderate climb or dive angles-- with no other accelerations going on (airspeed is staying constant or changing only slowly, and the flight path isn't curving up or down, and the wings aren't banked so the flight path isn't curving to describe a turn), lift is also staying nearly constant. This means that for shallow to moderate climb or dive angles, airspeed ends up being a pretty good guide to angle-of-attack-- to keep lift nearly constant, if the airspeed is low, the lift coefficient and angle-of-attack must be high. So the airspeed indicator is in essence an angle-of-attack gauge. At very steep climb angles where lift is quite a bit less than weight, things get more complicated-- if the aircraft is climbing straight up, lift must be zero, so lift coefficient must be zero, and angle-of-attack must be nearly zero (actually it must be slightly negative, unless the airfoil is completely symmetrical), no matter what the airspeed indicator reads. In actual practice in general aviation, commercial aviation, etc, a shallow to moderately steep climb is NORMALLY carried out a higher angle-of-attack and lift coefficient--and therefore a lower airspeed-- than we'd use for high-speed cruising flight. It's more efficient this way, and it also gives us the most climb performance out of a given, limited amount of thrust available. Why? Because a high lift coefficient also correlates with a high ratio of (lift coefficient to drag coefficient), which means a high ratio of lift to drag. For shallow to moderate climb angles, the higher the L/D ratio we can achieve, the steeper we can climb for a given amount of thrust. This is explored in more detail in the first link given in this answer. To look at climb rate rather than climb angle, we'd have to look at a chart of (power-available minus power-required) at various airspeeds or various angles-of-attack, but we'd come to a similar conclusion-- our best climb performance will be achieved at an angle-of=attack well above what we'll be using in high-speed cruising flight. The diagram in the original question doesn't touch in any way on the relationship between airspeed, angle-of-attack, lift coefficient, magnitude of lift vector, and L/D ratio, so it doesn't help us to understand why a shallow to moderately steep climb is normally carried out at a higher angle-of-attack than we'd use for high-speed cruising flight. Your question included the statement "if I pitch the airplane up, but also increase power and am able to maintain the same speed, then no, the AoA hasn’t changed, although it may have varied in the transition between one situation and the other." For shallow to moderate climb angles, your statement is true for all practical purposes, but it is not EXACTLY true. If we want to be very precise about it, we could note that since lift is slightly reduced in the climb, if airspeed stayed constant than angle-of-attack must have been slightly reduced, and if angle-of-attack stayed exactly then airspeed must have been slightly reduced. This same idea came up in these two related answers to related questions, though in these cases the lift vector was reduced because the aircraft was in a descent rather than a climb -- 'Gravitational' power vs. engine power and Descending on a given glide slope (e.g. ILS) at a given airspeed-- is the size of the lift vector different in headwind versus tailwind? "Are we changing the angle of attack by changing the pitch of an aircraft"
Yes! Let's start with an aircraft in straight and level steady state flight. We are taught "pitch controls speed, power controls altitude". If that was the only input, the nose would rise AND the plane would slow down. The increase in AOA causes an increase in lift AND drag. The altimeter would show an increase. Forces out of balance. If the elevator deflection was full, the AOA would increase until stall. With no power, stall. With full power either stall or loop! Unless there is sufficient power to loop, there will be a power-on stall. Pitch does control speed and will increase AoA. Lower degrees of elevator deflection will result in a climb and loss of speed. This is why pitch and throttle go hand in hand. Airspeed must be maintained by increasing throttle to continue climb, or the same inexorable process of lower speed and increasing AOA again occurs. However, with a slight pitch change with no power change, the aircraft may merely slow down a little and climb gently. But this depends on your airspeed and power setting before you apply elevator. IF YOU ARE LOW AND SLOW DO NOT PULL ELEVATOR OR YOU MAY STALL. ADD POWER TO CLIMB. And keep an eye on your airspeed. The lift component is reduced when you climb more steeply, that means you need less angle of attack and more engine thrust to fight gravity. Take this to the extreme: F18 going vertically, you need zero angle of attack and zero lift, your engines are providing enough thrust to counter the gravitational pull. The angle of attack will increase the most when you first increase the pitch. As you establish an angle of climb the angle of attack will begin to decrease. If you are able to maintain the same airspeed in the climb by increasing power than the angle of attack will return to the trimmed angle of attack. So if your pitch angle matches your angle of climb then angle of attack will be the same as before the pitch increase. As you pitch up the thrust vector points upwards and the lift vector points more backwards. So thrust has to carry some of the weight of the plane during the climb if the same Angle of Attack is maintained. Generally a decrease in airspeed (thus an increase of angle of attack) is preferred during climb (if on the front side of the power curve) as less excess thrust will be required to maintain a climb. There will also be less parasitic drag at the slower airspeed. What is not shown on your diagram is the pitch moment caused by the center of thrust not being aligned with the center of gravity. This causes a perturbation in the trim speed so retrimming may be needed with power increases. Angle-of-attack (AoA) is an aerodynamic parameter critical to understanding airplane stability, performance and control. AoA is the angle between a reference line on the airplane or wing and the relative wind or on-coming air. Two other angles are more commonly referred to in reference to the fuselage (Figure 2). They are the pitch angle (attitude) and the flight path angle. The pitch angle is the angle between the fuselage and the horizon and is displayed on either the artificial horizon or the attitude indicator. The flight path angle, also referred to as the climb or descent angle, is calculated as the vertical angle between the velocity vector (i.e., where the airplane is going) and the Earth’s horizon and can be displayed on the primary flight display as a flight path vector. 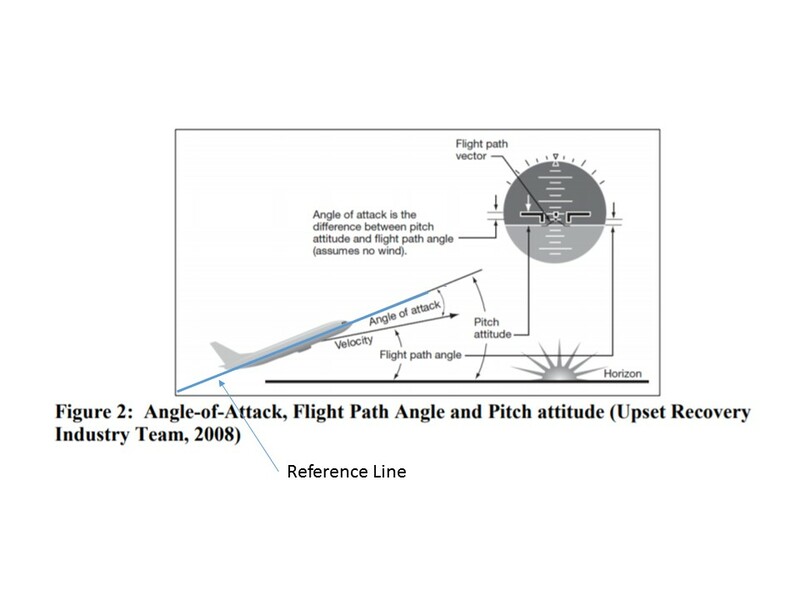 In still air (i.e., no wind), AoA is the difference between the flight path angle and the pitch attitude (angle), assuming no wind (Cashman, Kelly, and Nield, 2005). So if you can climb and keep the reference line of the plane equal to the flight path angle, the AoA will be 0. Otherwise, as you climb AoA will increase. Not the answer you're looking for? Browse other questions tagged aircraft-performance aircraft-physics or ask your own question. Descending on a given glide slope (e.g. ILS) at a given airspeed— is the size of the lift vector different in headwind versus tailwind? Which of these is true for a glider flying with constant angle of attack? Why are the wings of some planes changing width? For a B787 in cruise, what is the altitude, speed, and angle of attack? if center of pressure moves forward with angle of attack, then does it move forward of center of gravity also at a particular angle?